What is the Old Catholic Churches International? 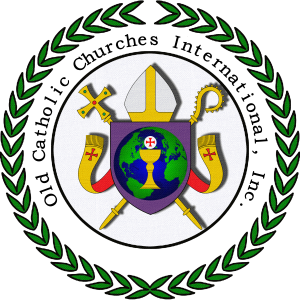 The Old Catholic Churches International is a Christocentric, Christian, Liturgical Denomination founded on the principles of biblical and apostolic worship and doctrine. Our parishes utilize the Novus Ordo as well as many of the Orthodox and Anglican liturgies. Though we are not Roman Catholic or any form of Mainstream Orthodox, we are catholic in the sense that we try to be universal. We are a part of the One, Holy, Catholic and Apostolic Church of Jesus Christ. Our Bishops have valid lines of Apostolic Succession traced all the way back to the Apostles. Is the OCCI a catholic church? Is it like the Roman Catholic, Greek Orthodox or Episcopal churches? The Old Catholic Churches International is an Old Catholic Church in the true sense of the word Catholic–one universal church under Jesus Christ. We are not a Roman or Greek Orthodox denomination, nor are we related to any of these. Our foundation is Liturgical and that is a shared attribute of the various liturgical churches, such as the Roman Catholic, Greek Orthodox, Episcopal, Lutheran and some parts of the Methodist Churches, but we pay allegiance only to God and His Son Jesus Christ. As patristic is defined as the study of early Christian writers, known as the Church Fathers, and the early Church Fathers as being those fathers of the church that lived in a period considered to run from the end of New Testament times (around 100 AD) until around the 8th century, the answer is yes. Is there a hierarchy in your church? The Old Catholic Churches International does have a Clerical Hierarchy. The head of our Church is the Presiding Bishop. He is chosen from among the Bishops of the church as “First among Equals” and is the Spiritual father of the Old Catholic Churches International. He is not infallible, but serves as Vicar to all of the Clergy. Beneath him are the Bishops over Dioceses, which may be geographical or organizational divisions. Churches are served by a priesthood and Bishops are assisted by the Diaconate. While this hierarchy is similar in nature to some other liturgical denominations, the important difference here is that all are equal in the sight of God, and decisions are made after much deliberation and without political influence. As you may see by reading our Canon Law, posted elsewhere on this web site, decisions are made by the entire body of the church, not a small group of unreachable leaders locked behind closed doors. The newest parishioner has access to the Presiding Bishop and all other members of the clergy. What if I wanted to see one of your services? Where would I look? Is there a parish near me? A list of our parishes is on our website under Our Communities. Where does the money come from to support your denomination? Are you affiliated with another church that finances your efforts? Ours is an independent denomination. We are solely supported by the donations of our members. Our clergy are currently a “worker priesthood” with many of us holding a secular position as well as carrying out the duties of Deacon, chaplain, priest, or Bishop. Our donations currently go entirely to the growth and support of the church, for the benefit of its members. If you are looking for a paid position, you have come to the wrong place. Like Saint Paul, we do not feel a priest should be a financial burden to his church (1 Thessalonians 2:9). What is the attitude of the OCCI toward divorce? We are mindful that there are times that continuing in a marriage is either detrimental to one’s physical well being or that serious defects in the marital relationship exist and thus divorce is necessary (1 Corinthians 7:15). It is for this reason that we allow divorced persons to remarry in our churches. Divorced people are also allowed access to all the Sacraments of the church. What is the OCCI’s attitude toward homosexuality? Homosexuality is part of the human condition and gay men and women are encouraged, along with their heterosexual brothers and sisters, to live full creative lives under the guidance of the Holy Spirit. All the sacraments are open to those who are homosexual. What is the OCCI’s attitude toward other denominations? We aspire to work with other churches in all aspects of ministry and regards ecumenism as a way of manifesting that ‘diversity in unity’ that should characterize the Body of Christ. We believe that all Christian churches have an element of truth in them and that their members are no less worthy of eternal life than we are. We further deplore the practice of churches declaring that only their members will obtain eternal life. What is the attitude of the OCCI toward other religions? All the great religions of the world are expressions of God’s graceful presence. The Old Catholic Churches International therefore looks to that presence, wherever it may be, that its understanding of the Christian tradition may be strengthened and deepened. We further deplore those religions or churches that seek to promote the doctrine that their members will exclusively receive eternal life while other churches and religions will not. What then distinguishes members of OCCI from other Catholics? Essentially, nothing. But, because of the emphasis given to the above factors, both the Old Catholic Churches International and its members tend, perhaps, to be rather more open and free. In this we try to bear witness to Saint Paul’s promise that ”Where the Spirit of the Lord is there is perfect freedom” (2 Corinthians 3:17). What is your policy on birth control? We believe that good Christian parenting requires loving parents to make the determination on the size of their family. We do not oppose pre-conception means of birth control. We do encourage natural methods of birth control over artificial ones. However, under no circumstances should abortion ever be considered a permitted method of birth control. We do not condone any form of assisted suicide. However, we do not believe it is immoral to remove artificial life support systems with the informed consent of the patient. What is your policy on abortion? We hold to the historical and Scriptural position of the catholic and orthodox tradition. The fetus is a human being at the moment of conception. Consequently, abortion is the taking of a human life. The only circumstance in which it is permissible is the clear and incontrovertible threat to the life of the mother. What liturgies to do you use in your church? The Old Catholic Churches International uses a variety of liturgies in our churches. You will find that most of our parishes use the Novus Ordo (the Mass used in the Roman Catholic Church from 1969 to 2011). However, there are parishes in our church that use Eastern Rite liturgies, the 1928 Book of Common Prayer and the Tridentine Liturgy. We do not mandate that parishes use a certain liturgy, we only ask that they use the liturgy their congregation is most comfortable with. What is a “Liturgical” church? A “Liturgical” church is a church that practices worship using a form known as a liturgy. This is a set and consistent program of prayers and supplications with scriptural readings from both the Old and New Testament, using Psalms, Lessons, readings from the epistles of the Apostles, and from the Gospel of Our Lord Jesus Christ. It also includes the Great Liturgy known as the Lord’s Supper, Holy Communion, or the Holy Eucharist. It is not the free form worship practiced in the Protestant denominations. Do your clergy wear all those vestments and use bells and incense in the worship service? Our clergy do wear vestments and at Special Celebrations of the Great Liturgy we do use incense and Sanctus bells. Our worship is a Glorification of God, where we pay homage to Him for the Divine Grace he bestows on us through the sacrifice of His Son, our Savior, Jesus Christ. We worship God who knows our needs rather than supplicating Him for our own purposes. Does your church admit LGBTI to holy orders? Yes we do. We accept women and LGBTI to the priesthood. We believe that all people are created in the image of God and therefore we do not deny them the opportunities to serve God as clergy. For more information about our views of LGBTI please click here and for more on Female Clergy please click here. If I were to become a priest in your church, where would I have to go to have a church? We are a young and growing church. That means you have the opportunity to define your ministry, whether parish priest or hospital chaplain. We have both in our organization, and there is room for more. If you feel inclined to “grow” a parish where you are currently living, we offer you all the support and training you will need, spiritually and personally. The sky’s the limit and your abilities and desires will be the determining factor in the type of ministry you choose. A vocation is God’s invitation or calling to each individual to love and serve Him and His Church in a particular state or way of life. That state or way of life may be a call to be a doctor, lawyer or even a priest. How do I know what God is calling me to be? You must pray every day, asking God to reveal His plan for you. Do not ask yourself, “What do I want to do with my life?” This is the wrong question! Rather, you should be thinking and asking: “Jesus what do you want me to be? How do you want me to love You?” And listen for the answer! Listen with your heart, not just your head. What is the procedure for becoming a cleric in your church? Consultation with the bishop or director of Vocations. Completion of application and all required documentation. The Candidate goes through a six (6) month discernment process during which they work with us. This is to make sure they are a good fit for the OCCI and that they feel the OCCI is a good fit for them. Evaluation and recommendation of the candidate by a clerical review panel assembled by vocations director who then makes a recommendation to the Diocesan bishop. Diocesan bishop then accepts or rejects the candidate. (Note: this acceptance is provisional only. The Diocesan bishop reserves the right to dismiss any candidate from the program for a canonical reason.). Candidacy will be celebrated at the discretion of the Diocesan bishop (Note: reception of the Minor Orders will be at the discretion of the Diocesan bishop if the candidate has completed the required academic studies prior to entering our formation program). After all required academic studies have been certified as completed and prior to beginning the internship, the candidate shall be ordained to the Order of Deacon. Completion of the required internship program. The application of any candidate for Orders, Religious Life or Incardination will be considered for approval only after ALL required materials and documentations are submitted. Does the OCCI have married clergy? Yes, as in the ancient church, its clergy are free to marry should they wish. We totally and completely reject the doctrine of forced clerical celibacy. Do you have female priests? Yes, we do. The Old Catholic Churches International does not choose its clergy on the basis of gender but rather their individual suitability for ministry. What if I am LGBTI, can I be a cleric too? Homosexuality is part of the human condition and our Sisters and Brothers in the LGBTI community are encouraged, along with their heterosexual brothers and sisters, to live full creative lives under the guidance of the Holy Spirit. We therefore place no prohibition on our LGBTI Sisters and Brothers that would bar them from the priesthood or religious life. If I am divorced, can I still become a cleric in your church? We recognize divorce as a reality, and we allow divorced persons seek admittance as clergy in our church. Does the OCCI have valid orders? Yes, all the Old Catholic Churches International’s clergy are validly ordained within the Apostolic Succession, passed on to it directly through the Roman and Old Catholic traditions and many more. It should suffice for us that God is satisfied. I am sure that neither you nor I wish for anything else. Let us then love our Lord, and give Him all without reserve.